Sheikhloo, Z., Salouti, M. (2011). Intracellular Biosynthesis of Gold Nanoparticles by the Fungus Penicillium Chrysogenum. International Journal of Nanoscience and Nanotechnology, 7(2), 102-105. Z. Sheikhloo; M. Salouti. "Intracellular Biosynthesis of Gold Nanoparticles by the Fungus Penicillium Chrysogenum". 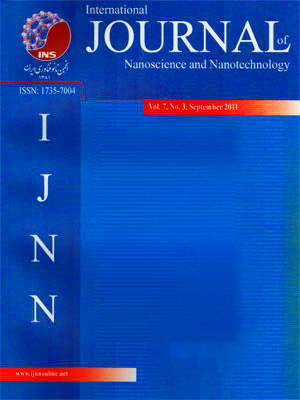 International Journal of Nanoscience and Nanotechnology, 7, 2, 2011, 102-105. Sheikhloo, Z., Salouti, M. (2011). 'Intracellular Biosynthesis of Gold Nanoparticles by the Fungus Penicillium Chrysogenum', International Journal of Nanoscience and Nanotechnology, 7(2), pp. 102-105. Sheikhloo, Z., Salouti, M. Intracellular Biosynthesis of Gold Nanoparticles by the Fungus Penicillium Chrysogenum. International Journal of Nanoscience and Nanotechnology, 2011; 7(2): 102-105. In this study, the biosynthesis of gold nanoparticles by Penicillium chrysogenum, isolated from Ahar copper mine, was investigated. The gold nanoparticles were synthesized by reducing the aqueous gold ions using the culture supernatant of the filamentous fungi. The UV–vis spectrum displayed a characteristic peak at 532 nm that is very specific for gold nanoparticles. The XRD spectrum confirmed the presence of crystalline gold nanoparticles. Transmission electron microscopy exhibited the intracellular formation of gold nanoparticles in spherical, triangle and rod shapes with the size range of 5 to 100 nm.